After watching the City Council meeting on January 8, “Improving the Design Review Process,” I am compelled to share my experiences. There has been an ongoing tree dispute on Ocean Way for years. Three of those years I have had a View Preservation Claim for a pre-existing view. The neighbors directly next to the tree owner have been in a dispute much longer. The city has allowed the tree owner and her representative, a former DRB member, to do what I feel is “work the system” in every way possible. Granting multiple continuances, while the tree has continued to grow to 60 feet x 20 feet, blocking numerous pre-existing views. The tree owner’s representative, again, a former DRB member, requested the plan be amended to include the now very large tree. I postponed my claim when an Assistant Planner in City Hall and a Code Enforcement Officer both told me the plan was not likely to be amended since the tree is blocking a number of pre-existing views. What they did no tell me was that if it were approved, neighbors could not file future claims. The DRB’s consensus was 4-1 denying the change in the landscape plan. It seemed the system was making sense. The applicant requested another continuance, even with the 4-1 consensus, and surprisingly it was granted. Now he has asked for yet another continuance for his fourth continuance. I don’t feel the city does its due diligence when view claims are filed. DRB tries to find compromises, but clearly this case should never have gotten to DRB. The tree has grown significantly taller since the city was advised of the violation. were screaming and in tears! The bird attacked a poodle! The dog fought for his life! skinned her knee amidst the strife! didn’t make it, no indeed! What havoc wrought the bird? Apparently, the third time wasn’t the charm. Following last Wednesday’s meeting at the White House, President Trump, Speaker Pelosi and Senator Schumer clearly aren’t any closer to reopening the government than they were the previous two times they met. America’s ship of state is rudderless. Even some of the president’s Republican supporters on Capitol Hill are beginning to second-guess the commander-in-chief. For the good of the nation, it’s time to fund vital programs currently on hold and pay the 800,000 federal employees who either are on the job, but working without pay, or furloughed (e.g. ordered to stay home). Ironic isn’t it? The border wall that Mr. Trump has insisted will make us safe is rapidly becoming a bridge to nowhere. The Mexican government, which U.S. voters were told in no uncertain terms would pay for the wall, must be laughing themselves silly. I wonder if President Trump has thought of starting a GoFundMe page for his wall. It might save face for him, it would show him who his supporters really are, and we could reopen the government. Scientists are baffled by an increase in “noise” from outer space – wonder if aliens are trying to figure out if Trump’s Wall will keep them from invading us? Over the past several days I and fellow volunteers have been walking Canyon Acres and Arroyo Drives and the adjacent Sarah Thurston neighborhood talking face-to-face with homeowners and residents about the most recent threat to the residential character and safety of our beautiful, family-friendly neighborhood. Though we missed a few neighbors, we have spoken with a large majority (over 100), and I hope to catch up with the rest in the coming days. I can tell you this: most of the residents here are angry, and some are furious. Sadly, there were a few who are resigned that the system is rigged against honest, tax-paying property owners. On August 22, 2017 the City Council approved the establishment of the Affordable Housing Task Force, whose mission is to research and provide recommendations to the Planning Commission for the development of affordable housing. One of the locations that the Affordable Housing Task Force has recently identified for possible high-density development is the large empty lot at the entrance to our quiet, residential (predominantly R1) street: 113 Canyon Acres Drive. This property is subdivided into three lots that were already up-zoned once in 2009 from R1 to R2. The Affordable Housing Task Force is discussing (see minutes) proposing to the Planning Commission to up-zone the property even further to R3 in order to be able to fit higher density housing at that lot. Conflict of interest? Here’s the kicker: One of the Affordable Housing Task Force members is Mr. Mohammad Honarkar, a local developer. But Mr. Honarkar is also the holder of a 60-year lease of 113 Canyon Acres Drive. As such, he could directly benefit monetarily from the up-zoning of this property from his ability, as a member of the Affordable Housing Task Force, to steer Planning Commission policy in his favor. Because Mr. Honarkar could gain monetarily from his influence on the Affordable Housing Task Force, he should resign immediately. And if the recommendation to up-zone his property is still ultimately made to the Planning Commission and they approve it, I believe this should be a matter for the District Attorney’s office to investigate. I am a bit perplexed by Michael Ray’s January 8th Letter to the Editor. Mr. Ray seems to feel Village Laguna is gaming the system by emailing their members/supporters about the sudden changes to the committee member appointment process proposed by Council member Peter Blake. Is this the same Michael Ray who was one of the founders of Liberate Laguna and a weekly columnist in the Indy? His is an organization which supported Peter Blake in the election, poured considerable monies into the election and, clearly, does not share the views of Village Laguna. [see Mr. Ray’s October 23, 2018 Letter to the Editor]. Is this the pot calling the kettle black or – simply a case of two groups of citizens exercising their right to free speech? Maybe we should all follow Mr. Ray’s October advice and be open, transparent, willing and striving to seek the best possible solution. Why are we continuing to support meter parking? The parking machines in our various lots work great. Why does the city continue to support meters? The meters get in the way of walking and are hazardous. City employees walk the streets emptying the machines and their time could be used for more important work. Stu News reporter Barbara Diamond’s intrepid exegesis on the state’s so-called “open meeting law” (AKA Brown Act) ranged from tedious to tortured, not a reflection on her formidable journalistic skills but rather the arcane anomalies of the state law she explained with precision (“New Councilman cautioned about possible Brown Act violations,” Stu News Laguna, Jan 8). To truly understand the Brown Act, imagine lobbyists for statewide local government associations helping to design the maze of illusory mandates we call the Brown Act. Touted as a sword for advocates of transparency in public proceedings, the Brown Act is actually a shield that protects city hall, school district and other local “legislative agency” bureaucracies from accountability for errors and wrongdoing. Thus, if a city council or school board takes official action that violates the law, the burden shifts to citizens who seek corrective action to bring a lawsuit within tight time limits. If the clock runs out or citizens cannot sustain the cost and burden of a lawsuit against governments with unlimited resources, the ill-begotten official action stands. Local government elected officials are drawn into codependent relationships with agency public employee bureaucrats promising to protect them from the exaggerated threat of Brown Act liability. Together elected and public employee local officials in turn become beholden to predatory law firms cashing in on incompetence and petty corruption in local agencies. Local officials are coached to run out the clock on the public seeking accountability. So lawyers train officials to practice a standard of legal compliance based not what’s right under the law, but what they can get away with. The result is that civil and criminal liability for improper official acts the public might have time to oppose successfully under the general state statute of limitations are in effect extinguished for Brown Act violations. Meanwhile, the Brown Act is mostly frequently invoked to harass and intimidate local elected leader who don’t accept the range of policy and program choices supported by the public employee bureaucracy to preserve the local government status quo. As Diamond correctly reports, it is no mistake a criminal charge under the Brown Act requires intent to deny public access to official public information, virtually impossible to prove but vague enough for a credible threat by the bureaucracy to rattle wayward elected officials. The Laguna Beach City Attorney used the press to deliver the message to Peter Blake, leaving him falsely accused in loud headlines, and damned by undecipherable hyper-technical disclaimers that fell well short of exoneration. Obviously, if no line was crossed there was no need for the public admonition singling out communications of the only newly elected member of the City Council who happens to be challenging the status quo. The City Attorney is not a prosecutor, he is not a public employee. He is the hired help. He has no authority to be issuing unilateral unsolicited advisory opinions to the public about an elected official. If he was directed to do so by City Hall he and whoever directed him should publicly apologize. All city employees responsible should be subject to disciplinary action, including termination for open and material display of bad faith and contempt toward an elected official. Council member Peter Blake desires to change the Design Review Board. He believes his changes will make it fairer and more reflective of the real desires of the community. 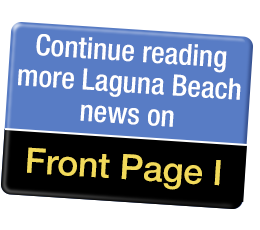 His opposition, primarily composed of members and supporters of Village Laguna, oppose any changes. “Happy New Year to all! as a team. Good for them. Bad for Laguna. The recent holidays have come and gone, but the wonderful act by the city to replant 30 of the longstanding empty tree well sites will remain with us for many holiday seasons to come. We commend the city for taking this urgently needed action. We also want to commend the coordinated effort among city officials and passionate citizen arborists and arboreal appreciators who all worked in a consensual manner to move this long overdue action expeditiously forward by working together in selecting the most optimal tree species. This replanting also reveals a distinctive and endearing feature of our small town regarding the value of citizen and city government engagement cooperation working together for a common good. While it is clear that being in public office always necessitates a sacrifice of personal time, fortunately, there are many citizens also willing to make such a sacrifice of time in contributing their expertise as professional arborists or simply tree appreciators to helping monitor and expand our green canopy. All these parties worked together in creating the wonderful Christmas gift of 30 newly planted, largest possible trees. Everyone is well aware that plentiful arboreal shade for our charming village streets insures our health, energy savings, water conservation, and mitigation of air pollution among other benefits. However, as City Manager John Pietig was most articulate in explaining recently, “the safety of our citizens, their children and the City’s visitors is paramount.” Those of us who are passionately concerned about the extent of our arboreal cover for the enrichment benefits of our communal lives couldn’t agree more. And this raises an important issue. Our unique city, surrounded as it is by belts of green and blue, is large enough to attract from 3 to 6 million visitors a year, yet we understand it is too small to have a budget to maintain the health of the trees in order to keep everyone safe. While the Laguna Beach Urban Tree Fund has been created to provide extra funding to both maximize the size of the tree replanted and enhance watering management (which it just did), we are hopeful that in the coming year budgeting can be reallocated by the city to also provide for regular maintenance and appropriate pruning of trees. We do joyfully celebrate our City Council, City Manager, and Public Works for both their wisdom in expediting the replanting of 30 of the forlorn empty tree wells and as we approach our Second Arbor Day festivities this coming March, we encourage and look forward to ever more support from the community and our City Management Team in protecting and increasing the providers of the shade we hold so dear in our increasingly hot summers!